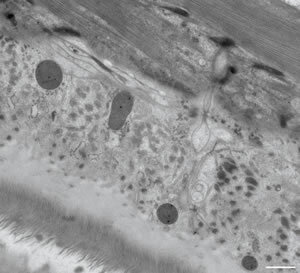 Ultrastructure of the roundworm Caenorhabditis elegans. 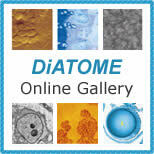 Scale bar = 1μm., Thomas Müller-Reichert, EM TechnologyDevelopment, MPI Dresden, and Kent McDonald, Electron Microscopy Laboratory, University of California, Berkley. A hydrophilic surface makes it easy to wet the cutting edge, even with a low water level. In 1989 J. C. Jésior (Ref. Jésior) demonstrated considerably reduced compression, smoother section surfaces and improved structural preservation thanks to the use of our ultra 35° knives. In the meantime, a large number of scientists have recognized the advantages of 35° knives, in particular for sectioning Lowicryls and non-homogenous specimens, as well as non-decalcified bone, dental materials, etc. 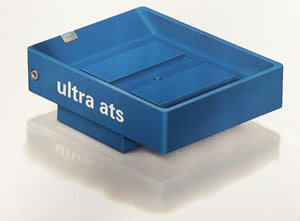 The ultra 35° knives are perfect for sectioning relatively soft materials research specimens including metals and polymers, as well as hard specimens such as semiconductors, superconducting oxides, catalysts, nano-crystalline ceramics, etc (Refs. Mahon, Glanvill, Swab, Quintana, Maniette, Schubert-Bischoff). 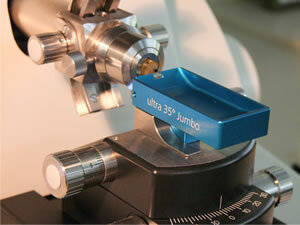 The ultra 35° knife has demonstrated it's usefulness as a standard knife for the majority of applications in both biological and materials research. The ultra 35° knife (in the triangular holder) with a cutting range of 100nm - 2μm is used for dry sectioning of epoxy or acrylic resin embedded biological samples, which need to be investigated by element analysis (Ref. Edelmann) and SIMS (Ref. Guerquin-Kern). The gliding of the sections on the dry knife surface is facilitated with the use of our Static Line II ionizer. Similar to our ultra 35° 3.0 mm with a greater thickness range (50-500nm). Acknowledged as the appropriate knife angle for routine sectioning of both biological and material research specimens, it represents a balanced compromise between section quality and durability.